This is an Electric Chair with a real working Tesla Coil connected to it. The Tesla coil has a fifteen thousand volt neon sign transformer hooked to it. A set of high voltage capacitors and a spark gap switch is used. 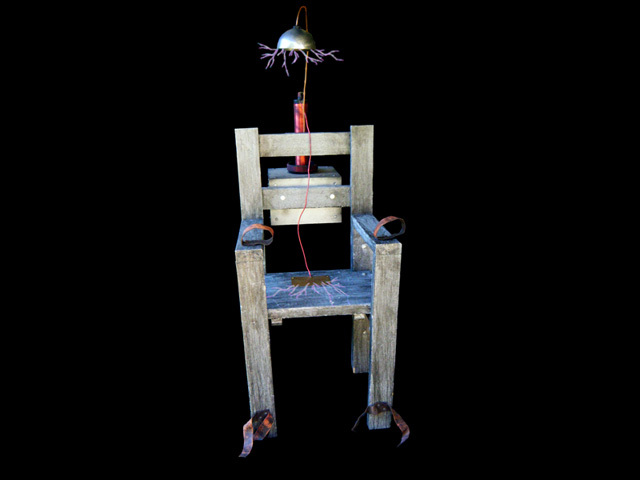 A main coil and a long second coil that is connected to the head piece on the chair. 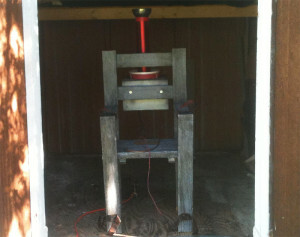 The Tesla coil puts out large coronas about a foot in length. Mostly safe, as long as there is not prolong touching of the arcs. The electricity gives off enough current in the air to light a fluorescent bulb by just getting it close. Made for a circus troupe and performed by Randi Rain.